All children, regardless of race or nationality, when given equal opportunity and a conducive environment, learn fast and enjoy learning—especially when the lessons are practical and include audio and visual stimuli. By emphasizing the practicality of a lesson, the children can see the relevance of the teachings to real life and embrace what they learn. The most fundamental teachers to each and every child are their parents, or for those who have lost their parents, their caregivers or guardians. In other words, the grownups they are being brought up by are their first direct teachers. In this regard, parents are at the core of a child’s psychological, behavioral, spiritual, mental, and physical growth. As such, they are the perfect guides to introduce the children to meditation practice. They are in a good position to practice together with their children, providing them with a platform to quickly learn this Buddhist art of living. The environment in which children are brought up also plays a major role in their spiritual and physical growth. Regardless of whether we are speaking of adults or children, we have similar patterns of likes and dislikes, and wholesome and unwholesome mental states, which include anxiety, happiness, sadness, anger, and restlessness. And it is very important to show children that everyone experiences these emotions and that meditation can help us control them. When children start with a meditation practice, the sessions should not be too long so that the children can enjoy the sessions, and the teachings discussed during the lessons should equate to the level of the child so they can comprehend the topic being introduced. Encouraging the children to relate their own experiences to the teachings will help keep them interested in the mindfulness exercises, while emphasizing that they can be open and share their experiences and feelings during the meditative period. On the same note, the teachers must also give examples of their own experiences when they are teaching meditation to children, and let them know what the outcomes and results are of a positive and successful meditation practice. At the start, rewards can be given to motivate the children and to make sure a habit is developed, at which time the meditation becomes part and parcel of their everyday lives. We all need assistance, and it is very important to guide the children in every aspect of their meditation practice. The one giving guidance should explain all the steps that are required to achieve the goals and objectives of meditation to the children. It is important to ensure that they understand the lotus position and all other postures used during meditation. Children should be taught that, once the meditative postures are learned, the most fundamental aspect of mediation is breathing, which is an exercise practiced by each and every living organism. If children leave a meditation session feeling inspired and able to see the relevance of what they practiced for their daily lives, then the session has been taught well. Some teachers make a huge effort to inspire their pupils by coming up with inventive ways of teaching and using real-life examples to show how meditation practice is a part of everyday life. Children often don’t realize the range of available meditation practice methods and have narrow views about what being a meditator means. In many cases, children only picture somebody using mediation to work toward religious goals and achievements, so it is important to show the children that meditation is also relevant to them. Parents and teachers should explain that scientific research has revealed that there are many health benefits when we practices meditation in the right way. Some of these benefits are—but not limited to—lower blood pressure, lower cholesterol levels, and reduced risks of heart disease and stroke. Relief from stress, depression, insomnia, sleeplessness, anxiety, worry, and increased productivity in learning are also common benefits. 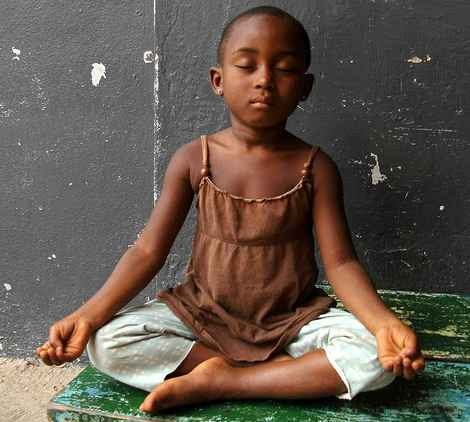 Starting a meditation practice at an early age prepares children both mentally and physically for growing up. It teaches them to be become better beings and enables them to develop good personal qualities rooted in their meditation practice, allowing them to forge a good path ahead. Mediation teaches qualities such as compassion, loving-kindness, endurance, tolerance, patience, and clarity, as well as inner peace and being in harmony with the nature and with everyone else. Most children and teenagers here in Africa love the supernatural — as do most adults. It has become such an important part of our everyday lives that most people cannot imagine not believing in what they see in movies, for example. Younger children especially like supernatural figures such as super heroes. Something changes in their imagination as they grow up and teachers start to introduce more complex concepts and employ more theory than practice in their lessons. This also happens when teachers move away from “fun” experiments, for instance in science class, to teaching theory—something that, at first glance, seems less relevant to the real world. Some might argue that children are not interested in meditation, but I don’t think this is true at all. They might not enjoy meditation lessons at a temple, but that is something very different. In workshops, meditation should be an interactive performance. Children should be left to create their own interactive processes covering the meditation they have just been hearing about. The language used in this interactive process must take the language the children grew up with into account; they not only need to understand the language but also to be able to share what they have learned. So, in some instances, it is a good idea to include a lot of humor in the lessons. When the children respond to humor, it is a good sign that they are engaged and understand what is being discussed. It is also impressive by how enthusiastically children embrace the tasks set for them when learning new things. African children like songs, dancing, and playing, and it is of the utmost importance to include some singing and dancing in practice sessions to make the meditation practice lively and enjoyable. This can include organizing tours to meet and interact with friends in a similar practice, or visiting game reserves, lakes, and mountains—which are ideal places for an inspiring meditation practice. Ben Xing (the Dharma name of Simon Manase Masauko) grew up in Malawi and underwent a three-year monastic training course at the African Buddhist College in South Africa. He was a volunteer at the Amitofo Care Center in Malawi.